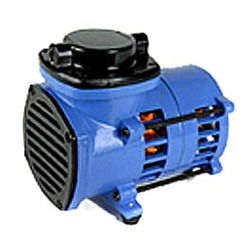 Providing you the best range of vacuum pump with effective & timely delivery. HPLC & for Evacuable Kbr Die for I R Spectroscopy. Material of Construction: Graded Aluminum Casting Voltage : 230 Volts AC, 50 Hz Max. Vaccum: 22" Hg Flow : 15 Itrs/min. Diaphragm: Neophrene - Nylon-Reinforced Inlet I Outlet Port Size: 1/BoNPT, Female Approx. Dimensions: 175 x 110 x 150 mm. Approx. Weight : 2.7 Kg.